Each new collection that Pion Design releases seems to get even more amazing! These new papers are just stunning. I designed the largest of these handmade hinged trunks to measure 7″x9″x3″ and the smallest one measures 4″x6″x2 1/2″. Each one opens to hold photos and other keepsakes. Many wishes for a great day! I made these hinged boxes and then used the Tim Holtz box corners to give the corners support and to also give them a real trunk look. 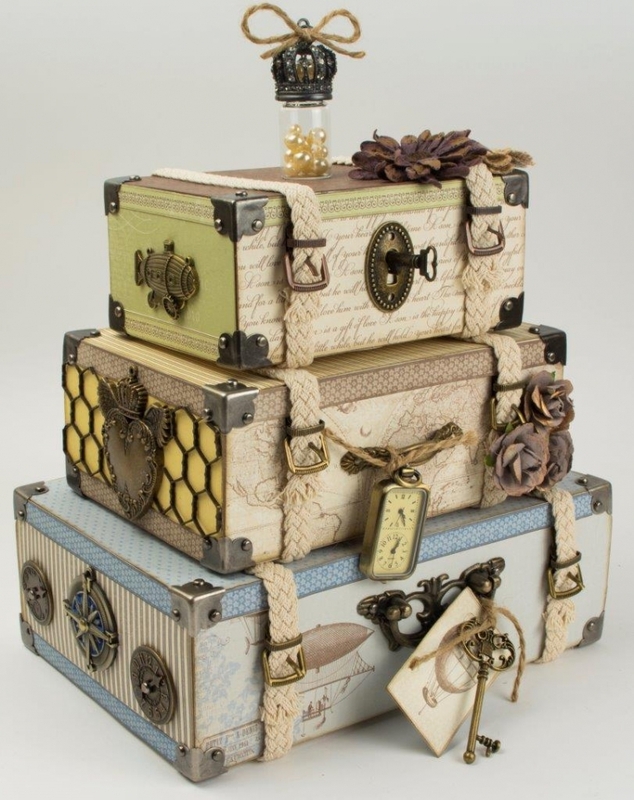 The box corners, buckles, and clock faces with game spinners are Tim Holtz Idea-ology products. The bottom box blue compass and top box submarine and keyhole are “Explorer by Traditions” products, and the middle box heart with wings is a Spellbinders (A Gilded Life) product. The box handles are “Spare Parts” products, and the “Old World Key” is a “Fairytale by Bead Treasures” product. I hope this helps! okay… i would love to make these… is there a video how to… please i hope…. I like your suitcase these are so beutiful, how did you do it. Do you have instructions and template so please send that.